The visit by US Secretary of State, if confirmed, would come at a time of heightened tensions between US and Turkey after an attempted military coup on July 15. 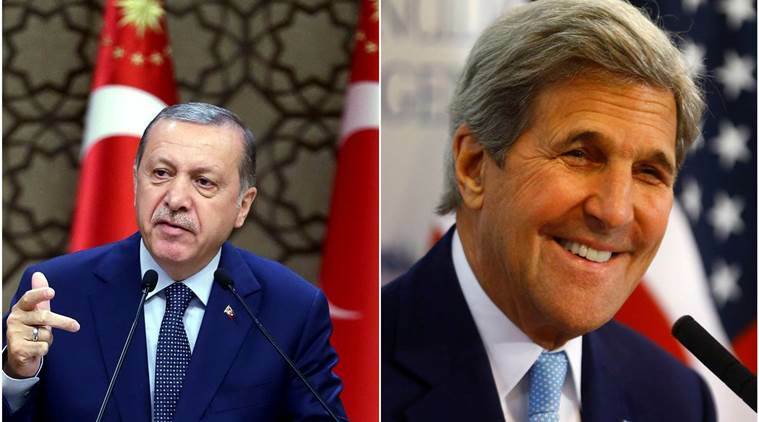 Turkish President Recep Tayyip Erdogan said that US State Secretary John Kerry intends to visit this month, in what would be the first trip by a top Western dignitary since a failed putsch. Kerry’s visit, if confirmed, comes at a time of heightened tensions between Washington and Ankara in the wake of the attempted military takeover on July 15. Turkey has been furiously demanding the extradition of Pennsylvania-based Islamic preacher Fethullah Gulen, whom it accuses of masterminding the coup. The government has launched a crackdown in its wake that has seen over 60,000 people within the military, judiciary, civil service and education sector dismissed, detained or put under investigation. “I think their secretary of state is coming on the 21th (August),” Erdogan said on Friday in a live interview with state-run TRT television. Within the next two weeks, a delegation led by Turkey’s foreign and justice ministers would also travel to the US to explain Gulen’s alleged involvement in the coup bid, he added. US State Department spokesman Mark Toner declined to comment. An Istanbul court on Friday issued an arrest warrant for Gulen, accusing him of ordering the coup aimed at ousting Erdogan. Ankara has frequently called on the United States to extradite the Muslim cleric, sending two sets of documents to Washington as evidence of his involvement in the putsch attempt. Gulen strongly denies masterminding the coup and the movement he leads insists it is a charitable network promoting tolerant Islam. Kerry said on July 18 that Turkey must present “genuine evidence” and “not allegations” against Erdogan’s former ally for his extradition. The crisis in Turkey has erupted at a time when the Ankara-Washington relationship is as important as ever, with the United States needing Turkish help in the battle against Islamic State militants in Syria. US fighter jets have been using Turkey’s southern base of Incirlik as a crucial launch point for lethal raids against IS targets in neighbouring Syria.